I’ve been meaning to make this post for a while. I spotted this scanned article on VWVortex over the holidays and it’s been on my to-post list since then.
. I painted it black on black because I have no skills building models and it turned out awesome! I wish I had a picture. […] but the 535i-based B10 Biturbo is surely the most impressive of them all: a comfortable 4-door that blends Rolls-Royce silence with Testarossa performance, with road manner to match. The B10 reached a maximum speed of 181 mph. At such speeds, the car feels entirely stable, with no suggestion of the front end getting light or any tendency to wander. Thanks to the low inertia of the two small turbo chargers and to the electronic wastegate control, response is nearly immediate n al most any circumstance. 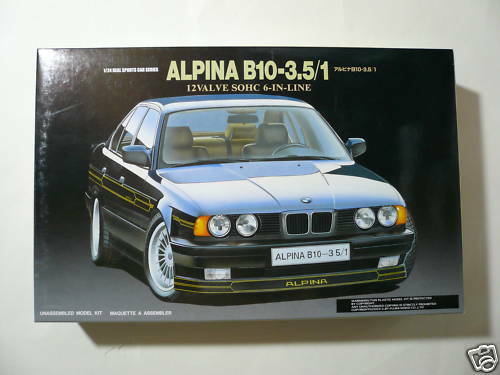 Ever since reading that article I’ve wanted to have a real Alpina. I’m going to have to keep an even closer eye on the classifieds having reread that article again! Please feel free to leave a comment with your Alpina experiences!